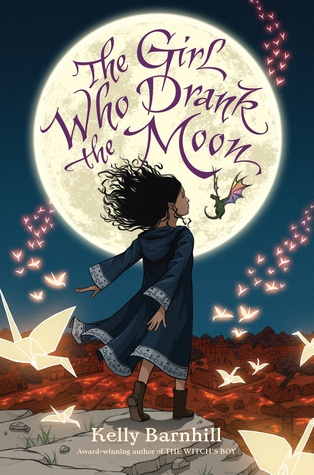 The Girl Who Drank the Moon by Kelly Barnhill (Grades 5-9). Algonquin Young Readers, August 2016. 400 pages. Review copy provided by my local library. Every year, the people of the Protectorate leave the youngest baby in the town as an offering to the witch who lives in the forest, hoping that will protect their village from her evils. But what they don't know is that the witch in the forest, Xan, is kind and gentle. She shares her home with a wise swamp monster Glerk and a Perfectly Tiny Dragon named Fyrian. Xan rescues the abandoned children and delivers them to welcoming families on the other side of the forest, feeding the babies starlight on the journey. But one year, Xan mistakenly feeds a baby moonlight instead of starlight, filling the ordinary child with extraordinary magic. Xan decides she must raise this enmagicked girl, Luna, as her own. To keep Luna safe from her own unwieldy power, Xan locks her magic deep inside her. When Luna approaches her thirteenth birthday, her magic begins to emerge on schedule, but Xan is far away. Meanwhile, a young man from the Protectorate is determined to free his people by killing the witch. Soon it is up to Luna to protect those who have protected her, even if it means the end of the loving, safe world she has always known. If you like magical fantasy stories with unforgettable characters, stories that are sometimes serious and sometimes funny - the Perfectly Tiny Dragon in this story is hilarious - pick up this book. I had been hearing major buzz about this book and it was for good reason. This book is awesome. It has that feel of a classic fantasy story about witches and forests and magic, but it's also a fresh approach that interweaves science and critical thinking and legend and being kept down by The Man. It's a review cliche to say that it's a story about the power of stories, but IT IS and this book approaches the power of stories in a way that's new to me. There's a lot of power here in WHO is telling the stories and the tale gives us a macro view of that while the characters are very much only seeing what's in front of them. The writing is rich and dark and complicated, but not in a way that bogs down the story. In a way that begs for a reread. I am sure that the Newbery Committee will be taking a close look at this one. Readers who like a rich, epic fantasy story might also enjoy Egg & Spoon by Gregory Maguire. I think the tone of these books is similar and Xan reminded me a little bit of Baba Yaga. Readers who enjoy the dark forest setting and the strong female characters might enjoy West of the Moon by Margi Preus, which is not fantasy but is based in fairy tales and features a feisty young heroine.